Sofa model 770 by Joseph-André Motte for Steiner, 1958. Black metal-lacquered feet. Recently reupholstered with the Bisson Bruneel fabric "Copenhagen". 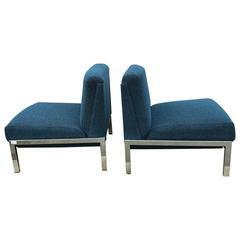 Matching armchairs are available, but not included. Senior sofa by Marco Zanuso for Arflex. Finn Juhl for Bovirke, Denmark, 1946. A sculptural sofa model BO-46 expertly reupholstered in contrasting Savak fabrics by Gabriel of Denmark. Prized "model 865" sofa by Ico Parisi, 1955.